A Morel. To be exact (I think), a Yellow Morel of the deliciosa type. In Michael Kuo’s book, 100 Edible Mushrooms, he calls this mushroom an “icon of fungal fanaticism.” If you know where they grow, a lot of the diehard ‘shroomers keep it secret. We found this one and two others under the third white pine from the water’s edge, over by the rowboat. Steve spotted them. We consulted Kuo’s book and were 99% sure it was a Morel. One had tipped over and you could see it had a hollow stem. Great hiding place for little critters–though it looked pretty clean. 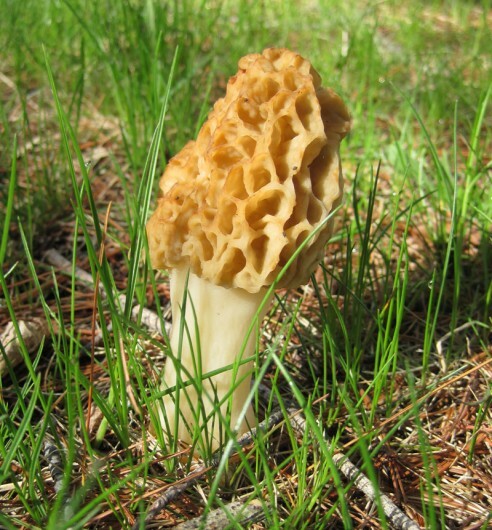 The key distinction between a Morel and a false Morel (which could possibly send you looking for a liver transplant–but mostly it just makes you wish you were dying) is that the real deal has its elongated pitted top attached directly to the stem, with no overhang. It could have been quite tasty. We were tempted. But being the cautious sort we called our young neighbor Neil over to check them out. He identified them as Morels straight away and pinched them off at their base. He generously offered them to us, but we took a pass. Neil sprinkled a few stem crumbs around, telling us this would encourage more to grow. Maybe. Maybe so. I like that idea. Interesting tidbit? Morels are members of the phylum Ascomycota. This means they release their spores from tiny structures called “asci.” Scientists don’t understand why, but all the Morel asci release their spores at the same time. And they sometimes release them just as they are plucked from their position on the ground. So if you see a Morel looking like it’s smoking, it’s just releasing its bazillions of spores. This entry was posted in Long Lake Flora and tagged Michael Kuo, mushrooms, Photo by Steve Thorpe, Yellow Morel by Noreen. Bookmark the permalink. Interesting for I had no idea what a morel mushroom looks like 🙂 My youngest son recently had his first dinner of venison and morel mushrooms. He ate over a new friend’s house and I can’t believe he tried both(He’s a picky eater here -mind you-) According to the family the morel is poisonous to eat raw, but it’s fine to eat as long as it is cooked. He absolutely loved the venison too! They are rather off-putting in appearance, aren’t they? And supposedly you really need to wash the little crevices and hollow stem well or else you’d be getting a bit of extra “protein” in with your mushroom. I’ve never read that they are poisonous when raw, though. This is very good readiing to go along with the photo! @Pat…thanks so much! Mushrooms are really amazing organisms.